Does Ohio Governor John Kasich, who is reportedly considering a presidential bid, have much chance against Republican heavyweights like Jeb Bush, Scott Walker and Marco Rubio? He might, if the party decides it prefers a moderate to a conservative. There’s nothing wrong with Kasich’s credentials. He won re-election by 31 points last year in the swingiest swing state in the land, and he maintains sky-high approval ratings in Ohio. But he starts at a substantial name-recognition deficit. Even among Iowa Republican caucus-goers — perhaps the nation’s most informed group of GOP voters — just 36 percent knew enough about Kasich to have formed an opinion of him. But nothing cures a name-recognition deficit like money to run advertisements and build a campaign operation, and Kasich is no fundraising lightweight. He brought in $21 million in his re-election bid last year, a solid total for a noncompetitive race. Still, how does he position himself against candidates like Bush who have gotten off to a faster start? The answer is pretty simple: Kasich can be the most electable representative of the moderate wing of the Republican Party. Bush’s favorability ratings may improve. It’s strange, in some ways, that so many voters have an opinion about him, since he last ran for election in 2002. Some voters may be mistaking him for his brother, former President George W. Bush, when asked about him in polls. But suppose that Republicans do know who Jeb Bush is and have reason to worry that he would underperform on the fundamentals against Hillary Clinton. 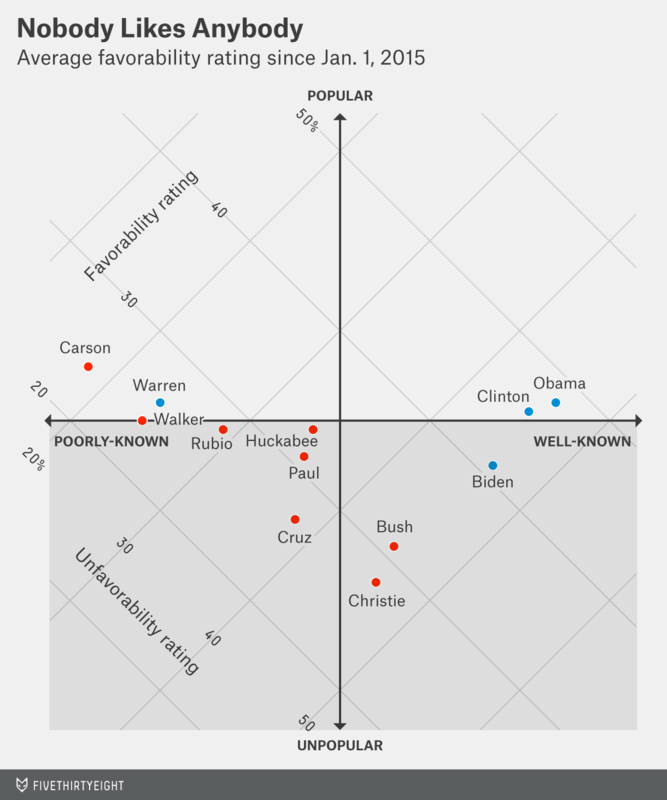 And assume, as we do, that Christie has little chance to see his favorability ratings recover. That leaves some room for Kasich, who can brag about his big victory margins in Ohio. Of course, if Republicans are satisfied that they can nominate an electable conservative, like Rubio or Walker, that would trump the rationale for choosing an electable moderate. That’s why we think the most likely outcome — if Bush has a rough rollout — is an improved chance for Rubio and Walker. 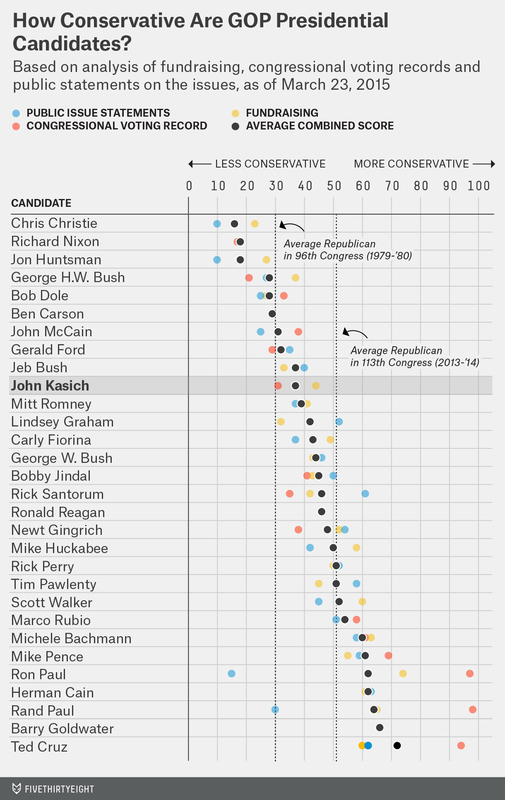 But Kasich may have as good a shot as anyone outside the GOP’s top tier.